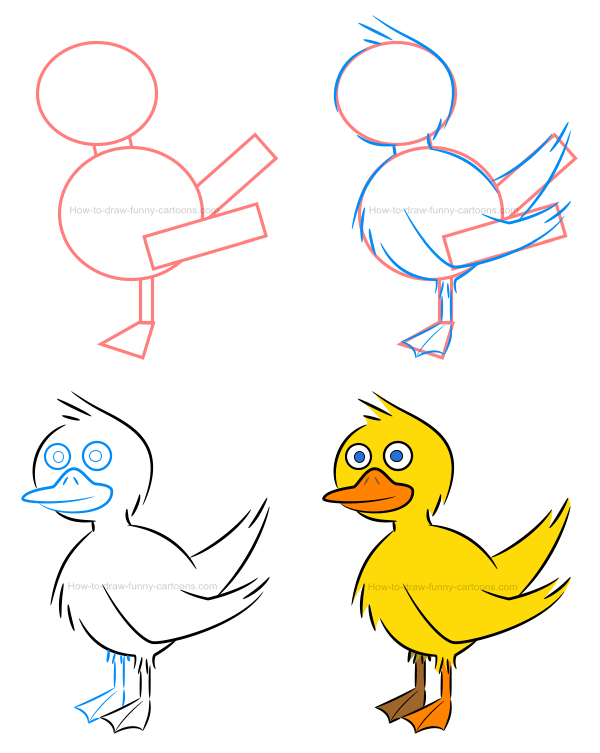 Create this beautiful illustration of a duck and then see how selecting the proper color for this cartoon character can be slightly more complex than you might think! 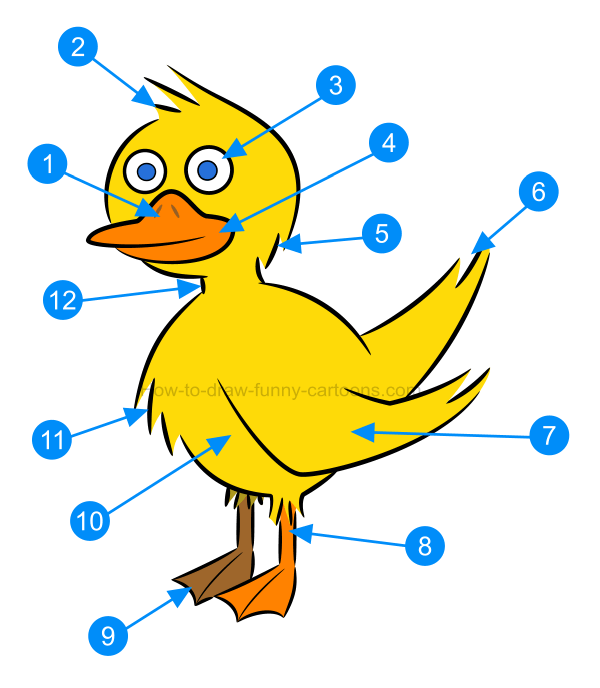 Duck are cute animals to illustrate, but some body parts can be tricky to sketch. Indeed, areas like the beak, the feet and the wings are made from shapes that are not always easy to duplicate. 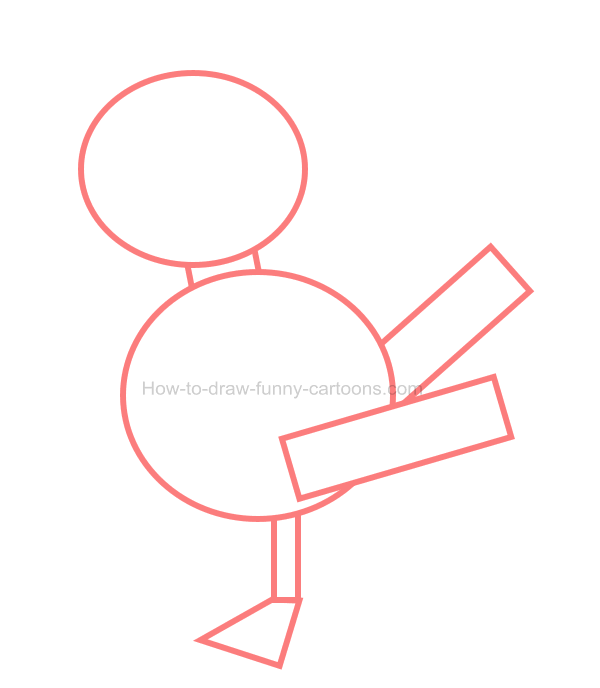 Using a few basic shapes, I will show you how to draw a duck that is accessible and fun to look at. Before proceeding with this lesson, let's take a few moments to see what makes this character so special using the picture found above. Inside the beak, two small lines are drawn to represent the nose. 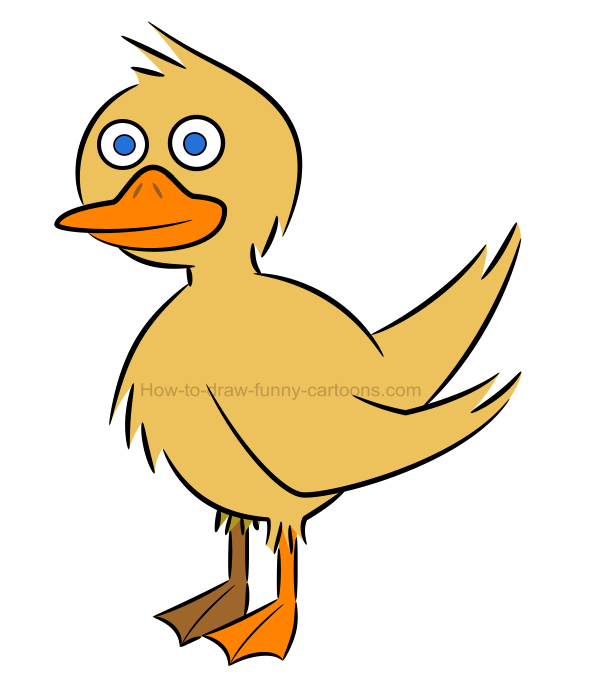 Some hair can be found on top of the head of the cartoon duck. The beak is large and mostly made from curved lines. More hair is visible near the neck. The tail is long and pointed. Look at the shape of the wing. This one is made from irregular lines. Legs are thin and short. Webbed feet made from triangles. The body is round and thick. Some hair can be found on the stomach of the character. The neck is large and made from short lines. Cool! 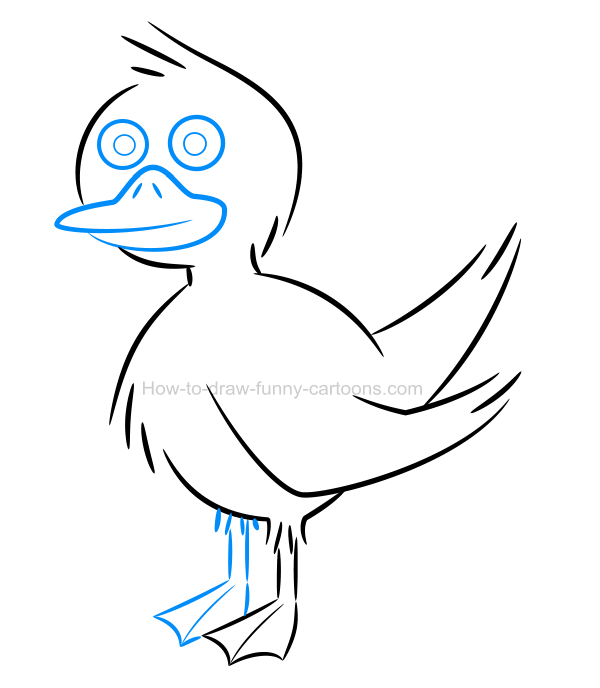 Now that we've spent a few minutes analyzing this illustration of a duck, why not proceed with the drawing lesson and draw a character similar to this one? Let's go! Let's add a few shapes to create a guideline that will be used to sketch accurate proportions. First, draw a large circle to form the head. The neck is made from a tiny square. Then, the body is drawn using a very large circle. The wing and tail are made from long rectangles while the leg and feet are done using more irregular rectangles. 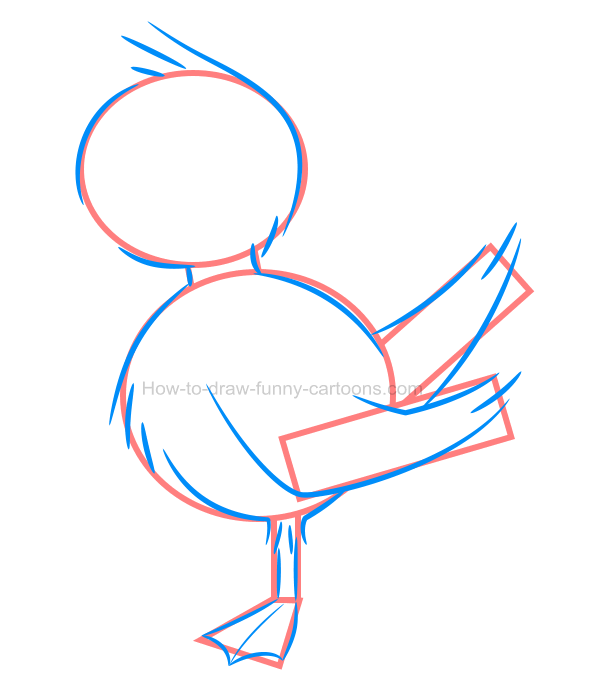 It's now time to draw this illustration of a duck using mostly a mix of curved lines. Don't forget to add hair on top of the head, near the neck, on the tip of the wing, on the tail and near the stomach. Some hair is also needed between the body and the leg. When you are done, you can permanently erase all orange shapes created in the previous step. Sketch small circular shapes to form the eyes of the animal. Pupils are done using smaller circles. The mouth is more challenging, so it might be a good idea to study the illustration below before proceeding. Two small lines are added inside the beak. Finally, complete this third step by adding the second leg on the left of the original one. step 4 - Time for some colors! Inside the character, apply a bright yellow color as shown in the picture below. The wing and the tail are also filled with the same color. The beak and the legs are colored in orange while the eyes are white and the pupils are blue. Lines found inside the beak are filled with a dark orange color. Are you sure you applied the proper colors? On the original character, the yellow color that was applied was also slightly orange. In the version found below, we have the purest yellow color possible. It's not quite realistic, but this is the color often used to represent cartoon ducks. Let's try something else! A little bit too green for me! In this second attempt, a little bit of green was added inside the character. Needless to say that the result isn't very convincing. Our little cartoon friend seems sick! It was worth trying, but adding some green color inside this illustration of a duck was definitely not a great idea. Why not try something brownish? 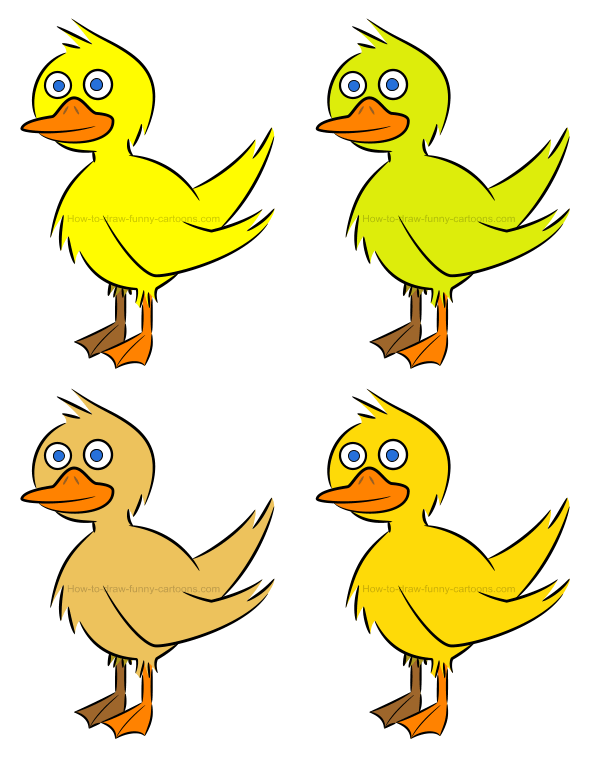 In this final version, the color of the cartoon duck is almost brown. In fact, it's simply a darker version of the color found in the original version. It's not a bad option, but the character doesn't look like a duck when filled with such a strange color. Experiment with this illustration of a duck and have fun! These are all four colors we tried for this tutorial. The original one is located on the bottom of the image (on the right) and it's probably the most appropriated one. The bright yellow one is also great, but it's too saturated for me!